The 3M Scott Safety 7400 Plus Controller is designed to provide simultaneous display and alarm functions for up to four monitored variables. 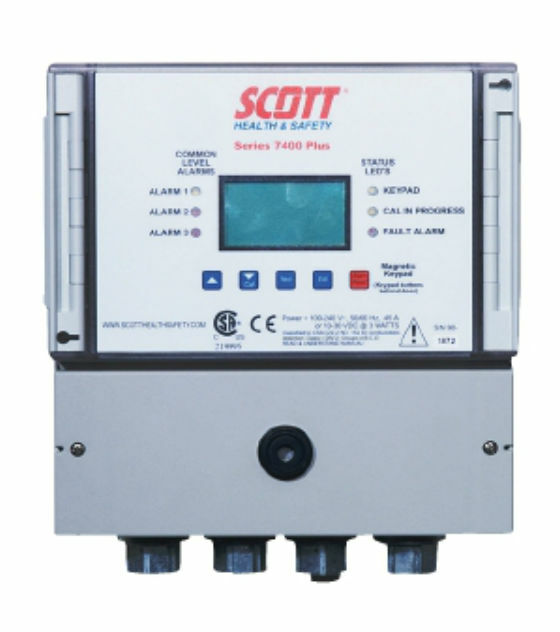 THE SCOTT SAFETY 7200 PLUS AND 7400 PLUS CONTROLLERS are designed to provide simultaneous display and alarm functions for up to four monitored variables. A graphic LCD displays monitored data as bar graphs and engineering units. Three adjustable alarm levels are provided per channel. Relay outputs allow control of beacons, horns and other alarm events. The controllers are easy to configure and are user friendly. Measurement ranges in engineering units, adjustable alarm set-points, optional serial interfaces and many other features offer flexibility to meet most demanding applications. The controllers utilise NEMA 4X rated enclosures and are CSA certified to CSA C22.2 No. 152 for combustible detection and Class I, Division 2, Groups A, B, C and D hazardous locations. An optional RS-485 MODBUS slave port allows up to 128 controllers to be multidropped onto a single data highway for interrogation by another MODBUS master. Other 7200 Plus options include six 5 amp SPDT discrete alarm relays per channel, 4 to 20 mA outputs and light stacks. Nonvolatile memory retains all configuration data indefinitely. Transmitter power requirements must be <12 watts.